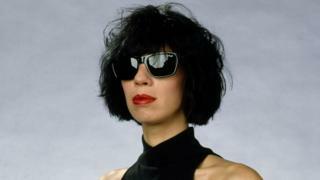 TV presenter Magenta Devine, known for her appearances on Channel 4's Network 7 and BBC Two's Rough Guides to the World, has died after a short illness. According to her family, the 61-year-old had been undergoing treatment at a central London hospital. Known for her sunglasses and stylish attire, Devine - real name Kim Taylor - was born in Hemel Hempstead in 1957. Her other credits include presenting ITV documentary series Young, Gifted and Broke from 1999 to 2001. In a statement, her family remembered her as "a talented writer and stylish on-screen presence who was greatly admired by her many friends and colleagues for her creativity and wit". She is survived by her father Gerald Taylor, her sisters Gillian and Georgina and her brother Nicholas. She had no children. Image caption Sankha Guha said his friend had "inspired a whole generation to travel"
Sankha Guha, who worked with Devine on the Rough Guide series and other programmes, said she was "an icon for a generation... who invited attention and sometimes hostility for her bold look and style". "She used her public persona to tell stories about the world that mattered to her and inspired a whole generation to travel with a sense of adventure and an open mind," he continued. According to Guha, Devine was representative of the "yoof" TV genre, "a new kind of television that had attitude, irreverence and a commitment to telling it like it is". "I knew she was ill, but her death is a body blow," he went on. "I have lost a soul mate and a partner in adventure." Devine started out as a music publicist, going on to promote her then-boyfriend's band Sigue Sigue Sputnik. She sought treatment in the 1990s for heroin addiction and depression and was declared bankrupt in 2003. "When I went into rehab, it was considered shameful to admit needing help for depression or drug addiction," she wrote in 2007. "Now it is almost like a badge of honour for modern celebrities." Tributes have been paid to the presenter, who also wrote articles and opinion pieces for The Independent and other publications. "So sad to hear this news," wrote Tony James of Sigue Sigue Sputnik and Generation X. "You were an amazing extraordinary woman."